The most recent issue of the Jewish Review of Books is now on the stands and online. 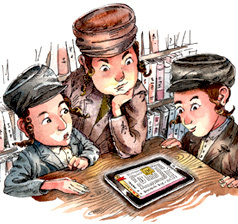 On the cover of the magazine there is an endearing drawing (below) by Mark Anderson of three cheder kids completely entranced by an iPad running a Talmud application. The image was commissioned by the JRB to illustrate a review of the ArtScroll Talmud App co-authored by our own Shai Secunda and Elli Fischer. The article is not just a review of a piece of technology, but a meditation on revolutions in Jewish learning media and the future of Talmud study in the digital age. The topic is as massive as it is important. Inevitably, not everything could be included in the final draft, and given the medium, sources and references were not cited. In the following post, the Talmud Blog includes some thoughts from the ‘cutting room floor’ on digitization, media saturation and their implications for Talmud study. An upcoming post will list some of the many articles and books that functioned as dialogue-partners for the review. The advent of the printing press in the fifteenth century had famously revolutionary effects in the Christian world (think Martin Luther), and less known but still substantial repercussions in Jewish culture. Yet, the next truly dramatic innovation in the media of Jewish study was inaugurated only in 1963. It was then that a project got underway at the Weizmann Institute in Rehovot, Israel to digitize rabbinic texts, mainly responsa, for the purpose of historical research. By 1979, the project had migrated to Bar Ilan University and its database was available at terminals on and off campus. The real breakthrough came in the early 1990s when the entire database was made available on a compact disc. Not only were the contents of a formidable Judaic library encoded in a small bit of plastic, but these contents were searchable. The vast erudition that characterizes the greatest talmudic scholars could now be replicated by a computer, inducing anxiety on the part of rabbis. The Bar Ilan Responsa Project is now on Version 19 20 and is considered an indispensable tool for teachers, scholars, and indeed rabbis, though one can still hear occasional polemics about reaching halakhic conclusions based on keyword searches. In truth, though, by now the Bar Ilan Project is a small part of the mind-boggling volume of data that is easily accessible and fully searchable using basic internet search engines. PCs and especially laptops have lessened the physical exertion and dampered the thrill of accumulating and working through a mountain of tomes in search of a solution to a particularly thorny exegetical riddle. For those who availed themselves of the digitized Torah libraries (and it should be acknowledged that many traditional Talmudists did not) the frenetic activity of the traditional study hall ground to a halt. There is no longer any need to consult the bookshelf or library when everything is a few clicks away. There is also little room for a study partner or any sort of live conversation when seated at a computer desk. The vast differences between the quiet library and the noisy beit midrash have been lessened somewhat. Not long after the release of the Bar Ilan CD, its traditionalist opponents complained that the classical notion of ‘toiling in Torah’ would go missing if Talmud scholars began learning off of computers. We laughed then, but from this vantage point, one begins to wonder. The Bar Ilan CD is no doubt a powerful reference tool that supports and enhances the study of printed texts. Yet, it keeps users tethered to the computer screen. Digitization and searchability may have changed the nature of talmudic and halakhic research, but they did not replace the book. This is actually the legacy of media saturation, the shockingly recent transformation of everyday life into a wired reality of screen ubiquity and wireless connectivity. Now, the computers are actually tethered to us, and they simultaneously tally Syria’s dead, recall the date of Shakespeare’s birth, and ferry messages to and fro. Our mobile devices are little more than sleekly packaged portable brains in jars. Actually, they are far more. The grey matter in my pocket is magically, creepily connected to the brains in yours. The mobility that the portable devices introduced to the experience of Talmud study seems like a relatively minor addendum to digitization, but its effects are profound. It is no longer necessary to stay confined to the beit midrash, like Bialik’s pale-skinned matmid, when the the bookshelf can be transported to the beckoning outdoors. There is something unprecedented in the presence of massive digital libraries on small portable devices. Within the dark confines of a pants pocket, a movable Borgesesque talmudic bibliotheca has grown up. Media theorists and New Yorker cartoonists have been diligently documenting the diverse cultural changes heralded by this newest wrinkle in the digital revolution. It is the transformation of the book that for many causes the greatest unease. To be sure, digitization has not yet finished off the physical book – and certainly not rabbinic texts – but that honor may well go to the e-reader and tablet computer, and soon. Along with the demise of the traditional book, bibliophile Luddites also fear for our brain chemistry and our family life. Media saturation with its ubiquitous hypertext links, pop-up ads, and assorted bells and whistles has pulled our attention in a thousand directions, making it difficult to pursue any one subject with single-minded focus. Educators, including Talmud teachers, lament their students’ lack of interest in the subject matter, offering Lamarckian theories about how skimming and skipping through material renders one unable to actually read. How can the mind that absorbs information in packets of no more than 140 characters be expected to get through War and Peace, with its one hundred thirty characters? Concerns have also been raised about what media saturation is doing to the fabric of the modern family. Many of us cannot pull our eyes away from Retina™ displays long enough to look into our children’s faces. This sorry if ubiquitous state of affairs has recently received thought-provoking artistic expression by the contemporary Armenian artist, Tigran Tsitoghdzyan. One powerful image from his ‘Millenium’ series (2012) plays with the intriguing feature of many classical madonna icons in which strangely, to modern sensibilities at least, Mary looks off to the side of the frame, apparently ignorant of attachment parenting’s most sacred rule – ‘lock thy gaze’. In this untitled artwork, Tsitoghdzyan depicts a modern madonna looking to the left, past the baby seated on her lap; her eyes and fingertips fastened to a smartphone. In the far right of the frame one can make out the dark edge of a television, which captivates the baby’s attention. But all this is old hat. Intellectuals, especially public Jewish ones, have for some time been whining about the disappearance of the book, the death of the publishing industry, and other assorted textual tragedies. Peddling dystopia is easy, and words weary. As we have seen, this is not the first time that changes in technology have altered the way humans obtain and process information, nearly always to the chagrin of the old guardians of knowledge. Perhaps the human mind is simply freeing itself from the illusion that ‘books’ ever really stood alone – hypertextuality makes intertextuality obvious – and rebelling against McLuhanian “hot” books that insist on progressing linearly. Is it possible that an entire generation has been misdiagnosed with Attention Deficit Disorder? Alternatively, is it possible that a brain wired to rapidly shift between stimuli is not disordered at all, and in fact better equipped to excel in a media-saturated environment? Despite the modern air-brushed veneer of Tsitoghdzyan’s madonna, which seems to preach to us about modernity and its discontents, the traditionalist iconography reminds us that we have been here before. As any voraciously reading, bookish parent knows, even prior the advent of the mobile device, texts of all types – magazines, newspapers, books, and really anything fit to print – fought for attention with the loving flesh and blood beings who make life worthwhile. In some ways, media saturation has simply made this bad habit a more common ill. In traditional Jewish society, a scholar who carries around a small volume of Talmud to peek at during spare moments is actually not deemed rude or distant, but industrious. He is really just an evolved form of the Jewish walking book – the “reciter” of the Geonic academy. At the beginning of the seventeenth century, due to certain technological and religious developments, highly portable talmudic tractates perfect for reviewing studied texts began to appear on the European continent. These quaint little books encapsulated a rabbinic ideology that hearkens back to Deuteronomy 6 and its exhortation to speak the Divine commandments “when you sit at home and when you walk along the road, when you lie down and when you get up.” Until recently, the modern version of these slim volumes were commonplace on New York city trains, Jerusalem buses, and London cues. Now, they are increasingly replaced by mobile devices that house unadorned digital Torah libraries. Digital mobility has now freed the Talmud from the study-hall; digital connectivity, from the sometimes isolation of Talmud study; and the hypertextual architecture of the web from the linearity of the traditional printed book. If only someone would design an app that could realize the explosive potential residing in the Talmud. Now that, would be ‘cool‘. I can’t claim to be much of a sports guy. Yes, I enjoy running, and I joined a makeshift ultimate frisbee team at my highschool for a couple of months (we were doomed from the get go- when it came to frisbee, the Modern-Orthodox kids were nothing compared to those from the Conservative day schools; why, I do not know), but that is pretty much the extent of my athletic career. I also cannot say that I follow sports all that much, and perhaps the two are tied together. But still, when it comes to the Olympics, I always end up watching my fair share, more out of awe for the amazing feats of athleticism than out of allegiance for the teams of my two home countries. Most amazing to me is seeing how athletes have progressed over the years, setting new records in almost every sport. While I try and shy away from claims of historical progress, these concrete numbers show that humans really are getting better at performing very specific actions, like “snatching” 188kg weights. The Dikdukei Sofrim Hashalem, which covers most of Seder Nashim. The Israel National Library’s website of Talmudic Manuscripts, which contains some of the Bavli’s main “complete” manuscripts. The Friedberg Genizah Project, for material from the Cairo Genizah. Yaakov Sussman’s catalogue (or, “Thesaurus”) of Talmudic Manuscripts, which lists all of the witnesses available on a particular passage. Perhaps the most heavily relied on tool of all, which may deserve more credit, is the Lieberman Institute’s Sol and Evelyn Henkind Talmud Text Database. Named for Prof. Saul Lieberman, the institute has been serving the world of academic Talmud for almost a generation. The Institute’s head, Prof. Shamma Friedman, has informed us that since the database went online last year, replacing the 5th CD-ROM version, it has gone through numerous enhancements in terms of how much material it contains. The website now has almost 1,330 transcriptions of genizah fragments and 300 transcriptions of complete manuscripts, transcribed by a team of dozens of scholars over the past few decades. Another addition are the almost 3,000 high-resolution images of the Mishnah and Talmud. About thirty institutions of higher learning are already subscribed. Along with the website of the Academy for the Hebrew Language and Bar-Ilan’s free Tannaim website, the database ensures that almost all of Rabbinic Literature has been transcribed according to the best manuscripts and is readily available online. Many scholars choose to copy from these databases and then check the transcriptions against photographs of the actual manuscripts, while some still insist on transcribing the manuscript evidence all on their own. An example of the proper etiquette for citing transcriptions of rabbinic texts available online. Another, and perhaps even more significant, feature of the Lieberman database is its sophisticated search engine. The possibility of using the Lieberman website to perform searches greatly enhances one’s ability to clarify many issues and phenomena across almost every manuscript and genizah fragment of the Bavli. For years, alongside the CD-ROM version of the text database, the Lieberman Institute produced a CD-ROM of a “Bibliographical Index”. Similar to Moshe Pinchuk’s site on the Yerushalmi, the index lists secondary literature that relates to specific passages of rabbinic literature. For example- someone looking to find secondary literature on a sugya that they are working on can simply punch in the daf number and immediatley receive references to academic works that deal with it. This database is also set to launch as a website, which will allow for constant upgrading by users and will link to the secondary material that is available online. The index includes the Mishnah, Tosefta, Bavli, and Yerushalmi. A preliminary list of the material included is available here. These databases, which will continue to grow with the help of user input and future technological advancements, will further serve scholars for years to come, ensuring the continued rise of the academic standard to new records. Come 2016, who knows what we will be able to do. Some new sites have gone up over the past couple of weeks that might be of use to our readers. The first, brought to our attention by Talmud Blog reader and commentor Zohar, is the Israel National Library’s new website of Rabbinic Manuscripts. This site replaces the old one (www.jnul.huji.ac.il/dl/talmud) with a new interface and- perhaps most importantly- the Leiden manuscript of the Yerushalmi, browasable by the pagination of the Venice edition. The site is still in beta version and they are looking for feedback. Feel free to leave your thoughts on the interface here in the comments section and we’ll make sure to pass them on to the library. Personally, I would prefer an option to search the Yerushalmi by chapter and halakha, and also that they list the folio numbers of the manuscripts. Regardless, users should be aware that much higher quality images of the Leiden manuscript are availble on the website of its home library (easily accesable here). The only problems with that site is that it’s hard to navigate and the pictues take a long time to load- ideally one could find the folio that she needs using the NLI interface, and then just open up the bigger picture on the Leiden site if need be. Also, for manuscripts with wide lines (like Leiden), the viewing window is relatively small. [The site still isn’t linked to that of the Munich library, whose manuscripts can be accesed from there or via the NLI catalog]. The Syriacists over at Harvard’s Dumbarton Oaks research institute have compiled a useful site: “Resources for Syriac Studies– an annotated collection of free and open source books, journals, and more related to the study of Syriac.” Kishmo kein hu– the site lists and describes dozens of PDFs of books available for free online that relate to all aspects of Syriac. I haven’t gone through everything yet, but it seems like they did quite a good job of finding all that’s out there. Many of these items should be of interest to Talmudists, from those who are just getting interested in Syriac (for whom I’d suggest starting with Brock’s A Brief Outline of Syriac Literature), and to those who already turn to Syriac frequently (see R. Payne Smith’s Thesaurus Syriacus). Amidst much fanfare, immigration lawyer and daf-yomi class teacher Daniel Retter published his index of the Babylonian Talmud, dubbed HaMafteach in both Hebrew and in English. As someone who often studies Talmud on the Sabbath and misses the various digital search engines while doing so, I fit the New York Times’ profile of someone who may want to purchase a copy. At 65 NIS, the price was right, but I would have to wait for the book’s second printing until I managed to get a copy from my local seforim store. Despite the fact that the book overlooks its predecessors, the volume is indeed impressive, and the author is clearly a talmid chacham who put countless hours into it. When reading the introduction I was particularly struck by one aspect of the book that I don’t think has received that much attention so far. Retter writes that the index is not one of words, but of ideas. In order to explain the importance of sifting through Talmudic sugyot thusly, the indexer cites the example of “pidyon haben“- which in one important discussion in the Talmud is refered to as “yeshua haben” (BK 80a). Needless to say, a casual search via an electronic database for “pidyon haben” would fail to turn up this source, and the importance of organizing the index by ideas is felt. In some- if not all- cases, this organizing principle can get rather subjective and even problematic. 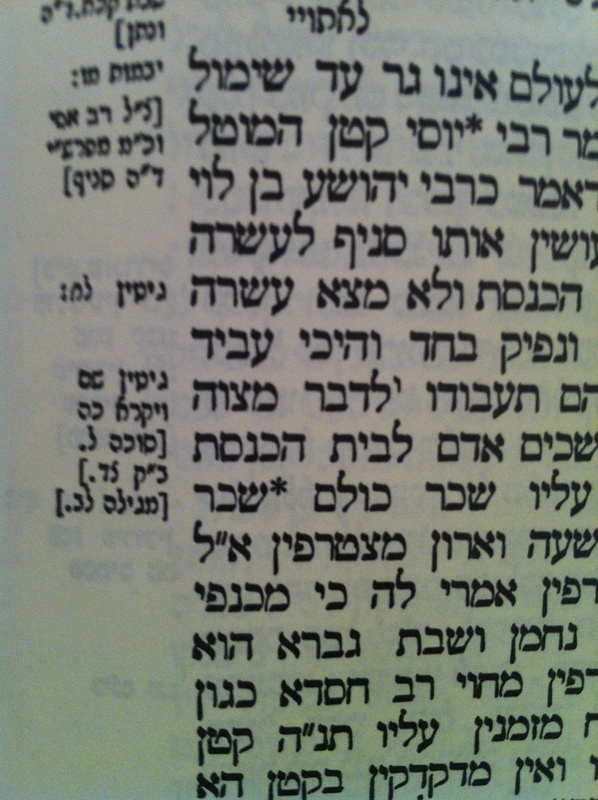 For example, the phrase “mitzvah haba’ah b’aveirah” comes up three times in the Vilna edition of the Bavli, at Ber. 47b, Suk. 30a and BK 94a (certain MSS also have it at Suk. 35a), yet the Mafteach cites five sugyot: the three sugyot in which the phrase occurs, and then two sugyot in which a similar concept is supposed to emerge – San. 6b and Meg. 32a. My immediate reaction to Retter’s organizing principles was one of surprise. While reflecting on that reaction of mine, I came to consider the rules that govern my own decisions with regards to which sugyot of the Bavli I choose to bring into discussion with one another. Philology, the love of words, has a tough time utilizing ideas, often deemed too subjective, in study and in text-editing. From the other end of the toolbox, one could argue that at least since De Saussure language has often been the grounding for Theory, leading, therefore, to an emphasis on words. Both the philological and theoretical modes of reading may have instilled a stronger focus on words, but more importantly, current search-engines are really what have been changing the way we approach the bavli. “Change”, because whereas Bar-Ilan, Ma’agarim, the Lieberman database (and still other computer programs) use words, generations of Talmud readers, have, like Retter, used other aspects of the Talmud to decide which sugyot are speaking to one another. To be sure, the virtues of the electronic revolution are numerous. Search engines have allowed corpora like the Tosefta, Midrash Halakha, and the Yerushalmi to enter into discussion with greater ease. But which sources have we lost along the way? In the wake of the Artscroll dinner a few nights ago, there has been lots of chatter about a mega-app recently developed for the Artscroll Schottenstein Talmud. Yesterday, Artscroll released an over-the-top, hyperbolic clip that shows some of the amazing things this app will do…when it is released in time for the new daf yomi cycle this summer |(h/t to Menachem Mendel) . Out of a nice conversation with my constant dialogue partner, the Adderabbi, the following thoughts emerged: Don’t get me wrong, Artscroll’s decision to embrace technology by creating a forward-thinking, e-book experience (and not merely digitizing books) is significant and laudatory. And make no mistake, even if they embarrassingly overuse the verb “elucidate”, you have to hand it to them. The first ‘Artscroll Revolution’ democratized Talmud study (including, certainly against their will, opening it up to women, to say nothing of non-Jews), and vastly changed the map of who was involved in Talmud study. Yet, with all the bells and whistles the new app looks like it will continue to perpetuate the sense one has while reading from a Schottenstein Talmud; that this is a fully coherent canon, even if every generation adds new insights channeled through a group of bearded men with positions of rabbinic authority, whose thoughts are collected in footnotes at the bottom of the page. The exhilarating experience of approaching a text where so much remains open-ended, gloriously ‘problematic’, and unaccounted for – and hence awaiting serious readers of all stripes and types to realize its meanings in a myriad of ways – is lost. A very well-funded, supposedly revolutionary app like this one is a kind of lost opportunity if it does not truly democratize Talmud study and turn it into a massive, ongoing, virtual conversation. A couple of months ago, the Talmud Blog experimented with using google+ as a forum for scholarly dialogue. Despite our efforts, it is mainly dormant now, though one wonders what might be if someone were to develop an app that allows people who have new insights into words, readings, and meanings in the Bavli to converse with each other over some kind of virtual medium. The possibilities are tantalizing and endless. I suppose we’ll have to wait a bit longer to see future. The other week, Leil Leibovitz lodged a complaint against the e-sefer and bemoaned the way that the iPad and its peers strip away the sense of holiness from the traditional experience of studying Talmud. Leibovitz laments the loss of the traditional talmudic tome – a hefty medium that commands our absolute attention. His complaint is particularly directed at the chussen shas‘ (the gargantuan set of talmudic tomes traditionally given to a groom before marriage) replacement- a sleek device that effortlessly allows its users to flit indiscriminately between Bava Qamma and Angry Birds. One reason Jews have managed to survive for millennia while other, mightier and more populous religious and ethnic groups vanished is our ability to engage in never-ending debate about the tenets of our faith. Rather than demand obeisance to tradition and rejection of modern developments or local customs, Judaism invites its adherents to argue, just as long as they’re all arguing about the same thing. This is all low-hanging fruit, and some of it surprisingly misguided. As Yitz reminds me, the story of Jewish textual transmission has been one of adaptation. Jews have moved along with the evolution of different media, even if at a pace different than their neighbors. Scrolls gave way to codices, which made way for the printed press. We have merely arrived at the next paradigm. Over at the New Yorker, Adam Gopnik recently crafted a taxonomy of the great “the-internet-has-irrevocably-changed us” lament. The same article might have been written about the loss of printed books and their replacement with e-readers – an act of mourning that I am surely joined in by readers of this blog (Here is merely the most recent and gorgeous example, by Leon Wieseltier). The point of Gopnik’s taxonomy, of course, is that a little perspective is in order. Indeed. In one fundamental way the e-reader actually perpetuates an older trend in Jewish learning, that of the handy and portable talmudic volume, which could be taken anywhere and allow Talmud scholars to realize the rabbinic vision of constant study (“day and night”). Whether through the Hebrewbooks app, ובלכתך בדרך or iTalmud, I find myself carving out more time to study than ever. It is a kind of De Certeauian response to the unstoppable onslaught of media that races through our portable devices. My old high-school principal, Rabbi Yosef Tendler, recently passed away. He was a gigantic man in more than a physical sense, and he cultivated a culture of total and constant dedication to Torah study. 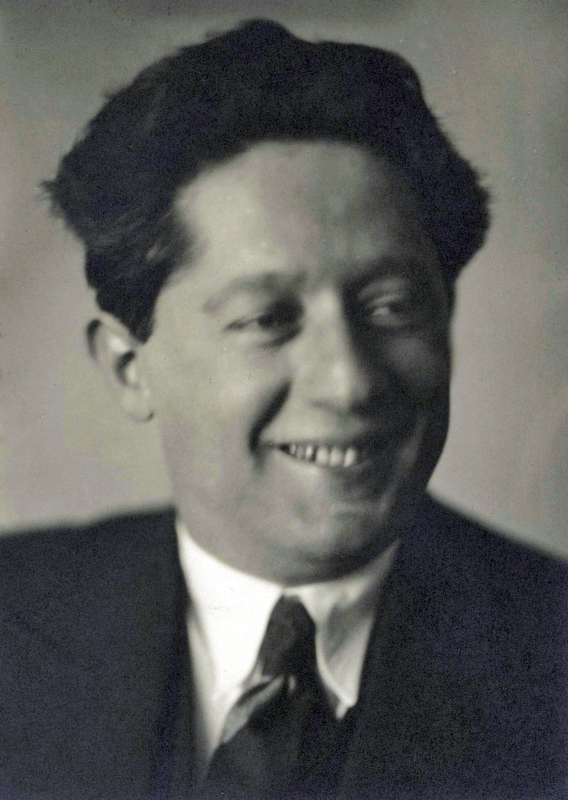 His mournful mantra – also constant – was “you’re wasting your life,” and in this he furthered the school of the Gaon of Vilna and its obsession with industriousness – where sins were deemed particularly tragic because of the time lost while committing them. It was not for everyone, and some students could not handle the pressure. For those of us who survived (and thrived) in this environment, the results have stayed with us even during stages and moments in life where such an ideal is all too often out of reach. The circadian rhythms of yeshiva life are indelible. Sometimes, vegged out on the couch on a late winter Thursday night (mishmar! ), I still go into a funk. Rabbi Tendler’s device of choice was an elegant portable talmudic tractate. As they like to say, he did not leave home without it. Rabbi Tendler used it to both forge ahead in his private course of study and also to review learning already acquired. The message was the medium, and the medium signified the constantly-studying Jew. Yet the portable Shas was no fetish. It hearkened back to the “pervasive orality” (Elman’s term) of rabbinic literature, with its reciters and walking books. When I learned (over the internet) that Rabbi Tendler died in early February, I realized that one of those walking books would walk this blessed earth no more. In a comment a few posts ago, JTS’ new digitization project was brought to the attention of the Talmud Blog by the indefatigable maven of online resources, S. Luckily, I’ve been working out of the JTS library for the past couple of weeks and was able to catch Joseph J. and Dora Abbell Librarian Prof. David Kraemer for a brief chat on the library’s various digitization projects. Manuscript digitization at JTS can be divided into three categories. First, the genizah material from the ENA collection is nearly available in its entirety via Friedberg. Some of the fragments had been available already on earlier versions of the Lieberman database, but even those have been re-photographed for FGP. Hebrewmanuscripts.org includes pictures of microfilmed manuscripts. While the images aren’t the best, the process was quick (the site now includes material from HUC as well). Since they last microfilmed their manuscripts in 1990, JTS has acquired another 800-900 items. The funds originally intended for the microfilm of these manuscripts have been reassigned for a digitization of them. So far around 100 have been taken care of. These manuscripts don’t have surrogates and therefore take priority over other items in the library’s collection. After they are done being digitized, the focus will be turned to the most artistically distinguished manuscripts, some of which are already available through their Special Treasure site. Under the leadership of Prof. Kraemer, the JTS library seems well qualified to take on the exciting challenges of the digital age. For more information on their projects I would suggest checking out their Facebook page. Now’s the time to subscribe to Netanya College’s Yerushalmi Database (מערכת מאגרי המידע של התלמוד הירושלמי), mentioned by Amit last week. Moshe Pinchuk, the site’s manager, just sent out an email informing subscribers that the database has been updated. The site provides a list of Rishonim (compiled via the Bar-Ilan Responsa project) and academics who discuss a given segment of the Yerushalmi, obtainable through searching either by column number, Mishnah, quote, or topic. It’s free to subscribe and the site also includes a free, reader-only version of the Hebrew Language Academy’s edition of the Yerushalmi. A similar site which also aids in the study of the Yerushalmi is Leib Moscovitz’s database of Yerushalmi parallels, which lists parallels from the Bible, Tannaitic Literature, Yerushalmi, and Bavli in separate PDFs for each tractate. Trying to jump from place to place in a long document like a novel is painfully awkward on an e-reader, like trying to play the piano with numb fingers. You either creep through the book incrementally, page by page, or leap wildly from point to point and search term to search term. It’s no wonder that the rise of e-reading has revived two words for classical-era reading technologies: scroll and tablet. That’s the kind of reading you do in an e-book. The codex is built for nonlinear reading — not the way a Web surfer does it, aimlessly questing from document to document, but the way a deep reader does it, navigating the network of internal connections that exists within a single rich document like a novel. Indeed, the codex isn’t just another format, it’s the one for which the novel is optimized. People studying Talmud, back in the day. Which, naturally, leads one to think- “what about the Talmud?”. On the one hand, the book is almost uniformly studied from its Vilna Edition; on the other, its digitization has enabled unprecedented search capabilities which have furthered its study. To make it only more complicated, it seems as though the Talmud’s “authors”, whoever they may be, intended on an oral transmission. Some of the earliest genizah fragments of the Talmud are parts of scrolls, and although they probably saw codexes in the hands of Eastern Christians, the early disseminators of the Talmud could never foresee innovations such as the Vilna Sha”s, Bar-Ilan, or Ma’agarim. This preamble is just so that I can ask how you learn the Talmud- from printed book or computer screen, and why? In related news, Mississippi Fred Macdowell has some helpful tips on “searching online in Hebrew with imperfect OCR“. 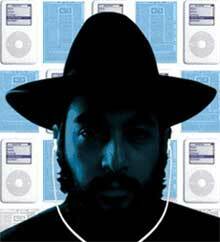 Finally, Yitz (not Landes) reviews the iMishnah app for iPhone and iPad over at Tzvee’s Talmud Blog. This Yitz doesn’t use iMishnah but is an avid iTalmud user. It’s well worth the money but I’m a little hesitant about iMishnah- it doesn’t promise much more than the free “ובלכתך בדרך” app, profiled here by Richard Hidary.